Replace paper forms to save time and money. Canvas replaces paper forms with customised digital versions. Access, edit and send BUSINESS FORMS on mobile devices . SHARE DATA easily and securely between the base office and remote workers. Send forms to suppliers and customers real-time via BUILT-IN EMAIL FUNCTIONALITIES allowing users to bill, process and fulfil orders faster. 9,000+ PRE-BUILT FORMS for users to use and amend. Key INDUSTRY VERTICALS such as construction and BUSINESS FUNCTIONS such as inspections. BUILD YOUR OWN business forms using the AppBuilder from Canvas. FIRST TWO FORMS CONVERTED FREE*. ADVANCED FUNCTIONALITIES such as GPS, image capture, dispatch, barcode scanning, electronic signatures etc. 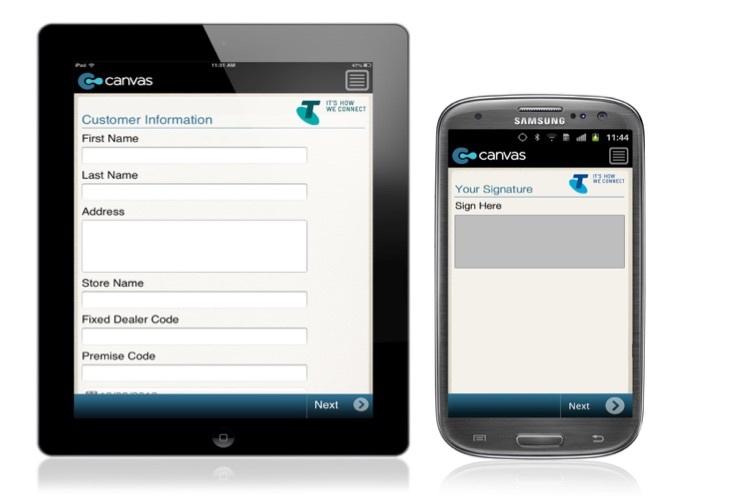 Canvas mobile forms work on Android, Blackberry, iOS, and Windows mobile/desktop devices. Reduce or ELIMINATE PAPER-BASED DATA CAPTURE and record keeping. No more lost or damaged paper forms. MINIMAL DATA RE-ENTRY and decreased printing cost. REDUCED TRAVELLING for field staff as forms are sent via emails and stored in the cloud. *Each Customer is entitled to have two of it’s own paper forms converted to digital format without additional charge. Charges apply for the conversion of any further Customer forms.